Smartphone usage is growing, putting a strain on our device’s batteries. We can now rarely make it through the day without “powering up.” Enter phone charging stations. Companies like ChargeItSpot are making phone charging stations accessible (and free) for power-hungry consumers that find themselves without a power bank. But not all charging stations are alike. This one’s pretty obvious. 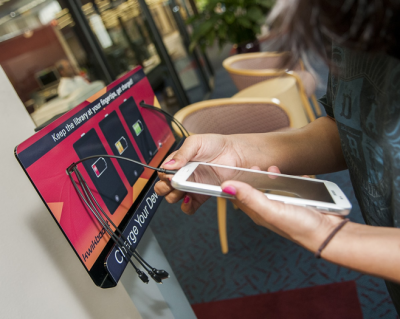 If you’re powering up at one of those floor stand charging stations, you may be tempted to leave your phone there, completely unattended, or you may get temporarily distracted and wander off a few steps. Either way, you’re more likely to expose your phone to thieves. Plus, who wants to stand around for 15, 20, or even 30 minutes holding their phone just so you can power up to an acceptable percentage? With a phone charging locker, you can secure your phone and walk away. It’s that simple. And ChargeItSpot charging kiosks use a two-step digital security system (password + security image identification) to ensure that no one but the rightful owner can retrieve the phone from the locker compartment. We also don’t require credit card swipes so you don’t have to worry about credit card fraud or unknown fees. Click here to read more about what makes our phone charging stations so safe. …or watch a game, or play a hand of poker, or wait for a loved one at a hospital. 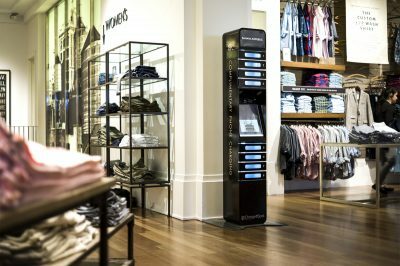 ChargeItSpot’s phone charging lockers are located in some of the most popular public venues, from like Neiman Marcus, Nordstrom, and Target to major sports stadiums, casinos, and even hospital waiting rooms. Find a charging station near you. For the busy multitasker, charging lockers are a no-brainer. You can lock up your phone and browse the store or run some errands, feeling confident that a charged phone will be waiting for you when you’re done. A customer who has locked away their phone at your store is a customer who is going to stay longer, and shop more. It takes at least 15 minutes to get enough of a charge to be able to use your phone again if you reached zero battery (and over an hour to go from 0 to 100!). That’s time that the shopper will most likely spend browsing your store. According to an independent study, ChargeItSpot charging lockers can double dwell time and increase basket size by 1.47x. Furthermore, customers who charged their phones in-store spent 29% more than those who didn’t! Phone charging lockers – unlike open floor standing models – are often equipped with a screen. Retailers can take advantage of our interactive 17” touchscreen from which they can screen promotional videos and collect valuable, opt-in customer data like email addresses, phone numbers, and survey responses. One of the most frequently cited reasons that brands choose a charging locker over an open floor standing model is because charging lockers simply look better. A charging locker has a classier, more premium look and feel than a cardboard billboard with a bunch of charging cords dangling under it. For premium brands, or companies who are more design-conscious in general, a charging locker is the natural choice. Furthermore, you can completely customize a charging locker. At ChargeItSpot, we offer our brand partners the ability to tailor every aspect of the kiosk – from its exterior wrapping to its touchscreen display. Even the security code options and post-pickup SMS messages can be customized to seamlessly integrate with the aesthetic of your store or the tone of your marketing messages. To find out more about how to lease or sponsor a ChargeItSpot phone charging locker, contact us today.